It goes without saying that access to medical care is even more crucial in space. Ever since the launch of Expedition One in 2001 to the International Space Station (ISS) and the beginning of long-duration stays, NASA has needed a way to monitor astronaut’s health. NASA’s Human Health and Performance team spend their days developing, planning and provisioning medical support for crews due to the significant effects microgravity have on crew members’ bones, muscles, and immune functions. So what did NASA do? They found a simple solution, telehealth technology. Doctors have always communicated with the crews on space missions regardless of length. Before long-duration stays in space were a part of NASA’s regular operations, doctors were used for guiding astronauts through acute health issues. However, today’s long-duration and exploration missions require medicine to serve a much wider array of issues; extending far beyond minor illness, urgent care, and prescription adjustments. As you can imagine, this isn’t easy and requires countless hours of planning and training prior to launch, as well as impeccably good communication throughout. Health care for each specific mission is carefully designed by NASA’s team of doctors, biomedical engineers, nurses, imaging specialists, and psychologists. The team carefully considers what NASA calls the Mission Profile: a broad set of factors that influence health and medical needs and risks that could potentially affect the level of care available to the crew. NASA’s team of professionals outline the medical requirements and capabilities in a given space flight program. Next, they must determine what materials and intangibles are required for a successful mission. Materials and intangibles range from medicines, instruments, and exercise devices to medical expertise on board and on Earth, procedures, and protocols. 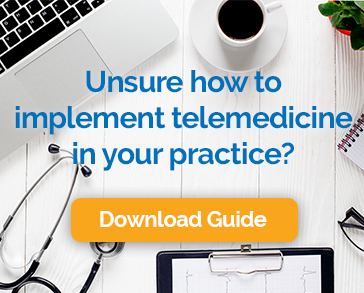 Telehealth technology brings all of this together in the form of a well-planned system that quickly transfers communications, information, and expertise in both directions as it is needed. NASA’s use of telemedicine shows the incredible potential to improve care in other remote or resource-constrained environments. Doctors can employ this same telehealth technology to provide high-quality care to patients living in rural areas or that might have a disability making it difficult to see a physician regularly. Patients would be able to discuss the medical concerns at their convenience. In a world with an ever-growing desire for convenience, patients will likely reward doctors offering video visits with their loyalty. Though NASA may use telemedicine for its spatial applications, doctors on Earth can utilize it for medication adjustments, remote chronic care management, follow-up visits, and reviewing lab results. All of the examples mentioned above show the great uses of telemedicine, but the financial benefits should be mentioned as well. With Chiron’s Rule Engine, patients go through an eligibility check to make sure the appointment is completely reimbursable through the patient’s insurance. Fortunately for doctors, this has only gotten easier thanks to recent changes in laws and regulations. This means that physicians can make incremental revenue from lowering overhead costs. Doctors can save time and increase appointment volume by keeping patients out of the office unless a physical exam is required. In some cases, patients will be able to save 3-4 hours of travel and wait time by seeing their doctor over video. Telehealth technology also allows for increased practice efficiency and organization. NASA is an extreme example of how telemedicine can improve the quality of care that millions of patients receive around the world. Telemedicine can be used for rocket science, but it doesn’t have to be confusing. With Chiron Health’s user-friendly platform it has never been easier to offer video visits to patients while staying HIPAA compliant. Get started with telemedicine today!